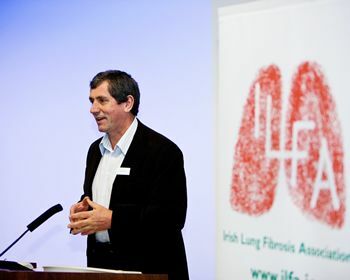 ILFA was founded in 2002 to honour the memory of Fergus Goodbody who died from Lung Fibrosis. ILFA was set up by Nicky Goodbody, the late Terence Moran, Marie Sheridan, and Professor Jim Egan. The primary aims of the Irish Lung Fibrosis Association are to provide a source of information and support to people with the condition, and to promote education and suppport research. ILFA is funded solely by donations and the fundraising efforts of our supporters are vitally important to continue our work. ILFA is registered with the Companies Office and the Charities Regulatory Authority. Our financial accounts are audited every year and submitted to the Companies Office following our annual general meeting, and published on the ILFA website. Postal address and address for correspondence: ILFA, PO Box 10456, Blackrock, Co. Dublin. Registered address: Lavery House, Earlsfort Terrace, Dublin 2. Directors: Eddie Cassidy (Chairman), Professor Jim Egan, Nicola Goodbody, Liam Galvin, and Nicola Cassidy. Gemma O'Dowd is ILFA's administrative assistant. Her role covers a wide range of areas, including assisting members of the Managing Committee in the running of the association, fundraising initiatives and raising the profile of ILFA. Please call Gemma on 086 871 5264 or email info@ilfa.ie if you have any queries. ILFA's directors and committee members are all volunteers who have personal experience of IPF, and healthcare professionals with a special interest in IPF. Our current committee members are Eddie Cassidy (Chairman, Director), Liam Galvin (Director), Professor Jim Egan (Director), Nicky Goodbody (Director), Nicola Cassidy (Director), Marie Sheridan (Treasurer), Michael Geoghegan (Secretary), Dr Kate O'Reilly, Marie McGowan, Lynn Fox, and Lindsay Brown. The committee meets every 4-6 weeks in Dublin city centre. Please contact ILFA , write to ILFA at PO Box 10456, Blackrock, Co. Dublin or call 086 871 5264 if you have any queries. Click here to read more about the work of the committee. ILFA is registered with the Companies Office and the Charities Regulatory Authority. Our financial accounts are audited every year by Whiteside Cullinan & Co. Accountants and submitted to the Companies Office and the Charities Regulatory Authority following our annual general meeting. ILFA's finanical year runs from 1st March to 28th February inclusive. ILFA's Financial Statements provide details of the charity's income and expenditure for the finanical year. All our finance comes from fundraising activities and individual and corporate donations. To learn more about our fundraising activities please visit our News and Events and Fundraising pages. Click here to read how funds are spent by ILFA. ILFA are lucky to have four well known and hugely popular patrons associated with our charity. We are grateful to our patrons for their continued support. Michael Darragh Macauley, Dublin GAA star became ILFA'S Exercise Ambassador in June 2013. 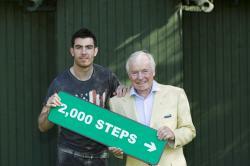 Michael Darragh helped to officially launch the ILFA 2000 Steps A Day Exercise challenge along with Senator Feargal Quinn. It is hoped that Michael Darragh's strong association and passion with high level sport and exercise will inspire all of us to commit to a more active, healthy, energetic and disciplined lifestyle. Michael Darragh is also a campaign ambassador for "Make life your legacy" and supports the "Opt for Life" call for the introduction of the soft opt out model of organ donation in Ireland. Andrea Corr musician, songwriter, singer, and actor was the lead singer in The Corrs, with her sisters Caroline and Sharon and her brother, Jim, before embarking on her solo career in 2007. Andrea’s latest album, Lifelines, in which sings covers of songs that were important to her when she was younger, was released in 2011. In 2005, Andrea was awarded an honorary MBE for her contribution to music and charity. Andrea has a particular interest in IPF . Her mother, Jean, had IPF but unfortunately died in 1999, while awaiting a lung transplant. The Corrs tribute album, Home, released in 2005, is dedicated to her memory. Andrea said "I am delighted to be a patron of ILFA which is obviously a charity very close to my heart". 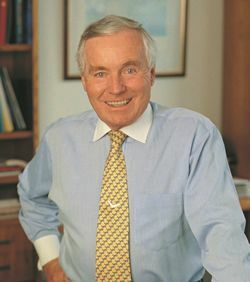 Senator Feargal Quinn is probably best known as the founder of Superquinn. He was also Chairman of An Post for ten years during which the National Lottery was launched. More recently Senator Quinn has appeared on TV. "Feargal Quinn’s Retail Therapy" was highly rated and was followed by a series called "Local Heroes – A Town Fights Back" which followed the transformation of Drogheda town. Since 1993, Feargal has been an independent member of the Seanad and in 2008 he introduced the Human Body Organ and Human Tissue Bill in which he proposed a change in the organ donation system from an opt-in to an opt-out system. Senator Quinn continues to raise this matter regularly in the Seanad. In 2011, Seantor Quinn accompanied a delegation from ILFA who met with the Minister for Health Dr. James Reilly, T.D. Feargal took part in the ILFA Tenth Year Anniversary Interfaith Celebration in Whitefriar Street Church in May 2012.
is a well known and hugely popular public figure. He was the Chief News Correspondent and the Washington Correspondent for RTÉ News and has presented a series of nature documentaries for RTÉ when he traveled to the Amazon, the Ganges and the Artic. Charlie became ILFA patron in 2007 and was present at the Patient Open Day in April 2008 where he officially launched the ILFA "Directory of Services". "I was delighted to be asked to launch the Directory of Services for ILFA. It is great to see how important a self-help group like ILFA is in getting things done. I would also like to acknowledge Professor Jim Egan and all the medical staff in the Mater Hospital for their work and dedication to helping people with IPF."